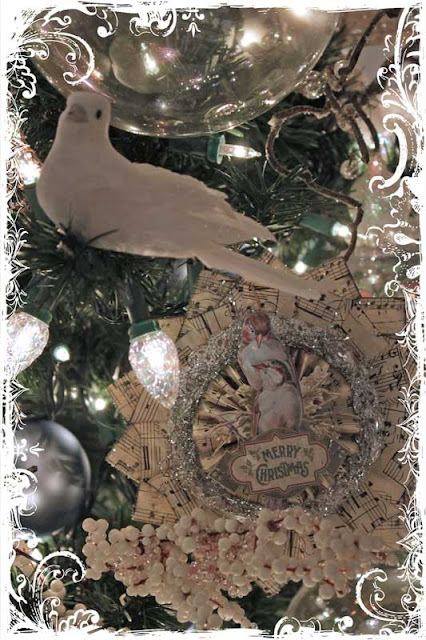 Today I am joining Honey at 2805 for a Christmas tree blog party and Debra's Common Ground for a Vintage Christmas Inspiration blog party. 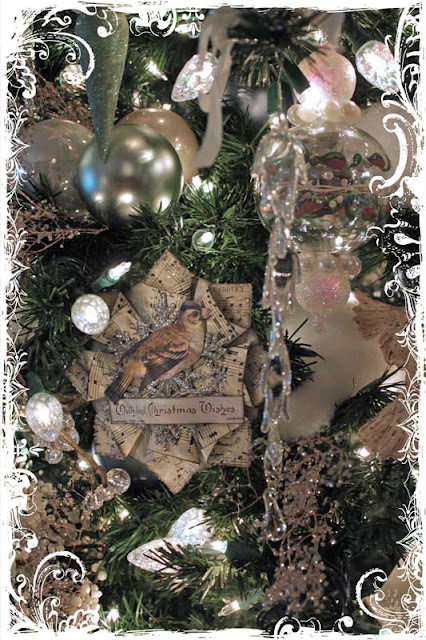 I have two trees to share with you today and a few tips on how to make your Christmas trees even more fabulous than they already are. A large percentage of the ornaments are handmade. I like to make sure there are plenty of lights deep inside the tree as well as on the outside. It really makes the tree glow nicely. Another handmade ornament. 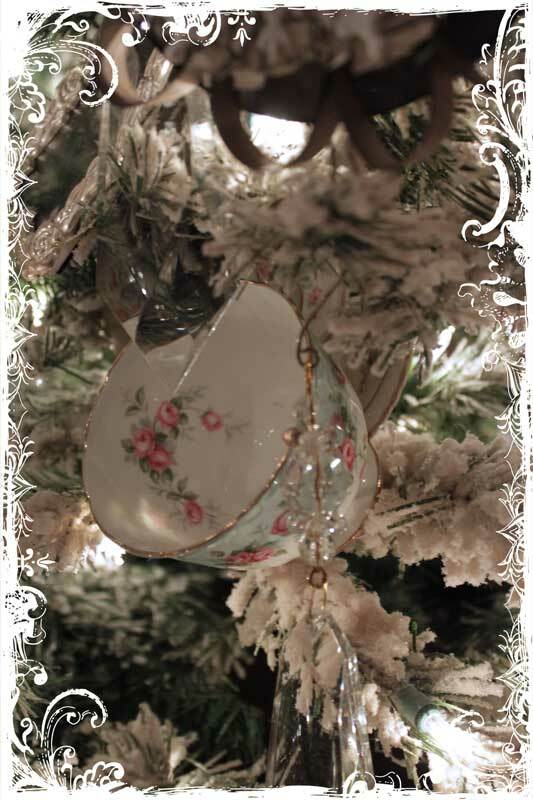 If you missed the pics of the other ornaments you can find that post here . And if you missed the post where I did my pipe cleaner ornament tutorial you can find that post here. 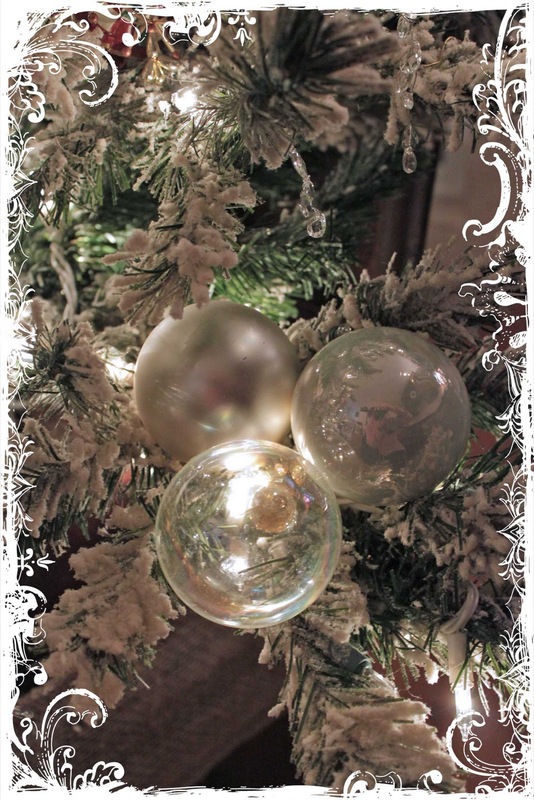 In addition to handmade ornaments I also use alot of the glass balls that you can get at Michael's or Hobby Lobby. 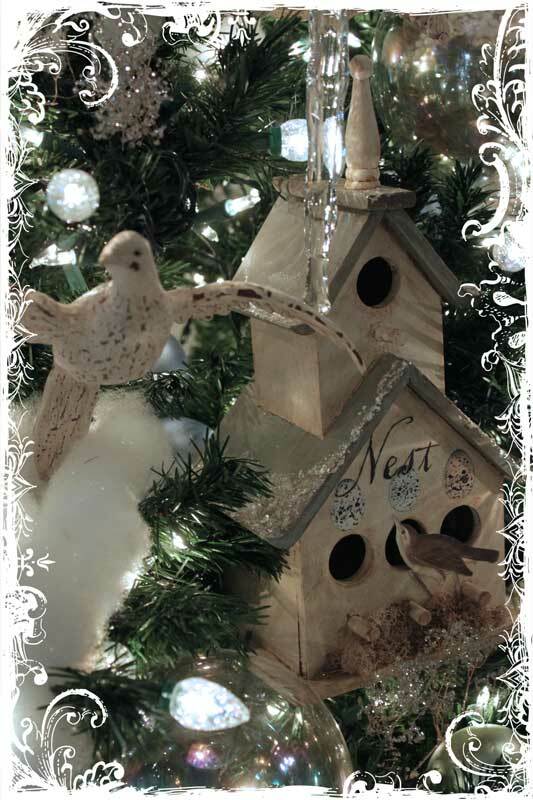 They are inexpensive, and really help to fill in the tree. Rather than hanging them one by one from ornament hooks, I group 3 of them on a pipe cleaner and wire them to the top of the branches. I love drippy things. (You will see a lot of this on this tour.) 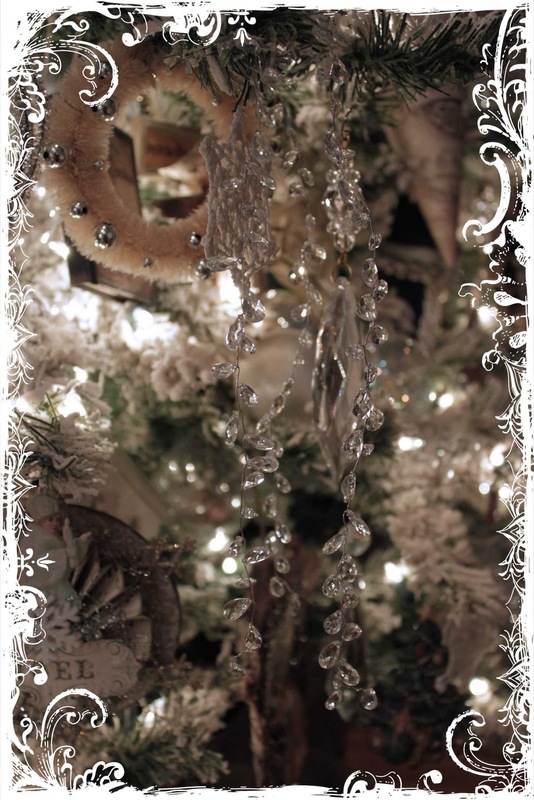 Nothing sparkles as much as crystals and glass on a tree. These are hanging down from almost every branch. I also like to hang unusual items in the tree. It makes it much more interesting and love hearing visitors say things like.. "Hey! There are dishes in your tree!!" This is the tree in the Living room. I try every year to get away with only doing one tree now, but my hubby is spoiled! He loves the decorations so much he's not happy if both trees aren't up!! To create the "snow" I took quilt batting and rolled the edges under. Then I sprayed it with spray glue and sprinkled diamond dust all over it. Then I just laid the pieces on the branches. This tree has a bird theme. It is covered with as many glass icicles as I can put on it. They really sparkle at night. This tree also has handmade ornaments on it, although I still need to make a lot more. I just add to it every year, because eventually I run out of steam! I found some wonderful twinkle light at Ace Hardware a couple of years ago, so this tree just shimmers!!! Again, I put things in the tree that are not necessarily "ornaments" In this case there several birdhouses wired into the tree. I made a nest out of grapevine, shredded music sheets, cheesecloth, and tinsel. Then I painted and speckled some cardboard eggs. I hope you enjoyed a peak at my trees. Here are the tips I learned from a great teacher while working at his design studio/store during the holidays. 1. Make sure there are plenty of lights inside the tree as well as outside. It will really make a difference to the finished look. 2. 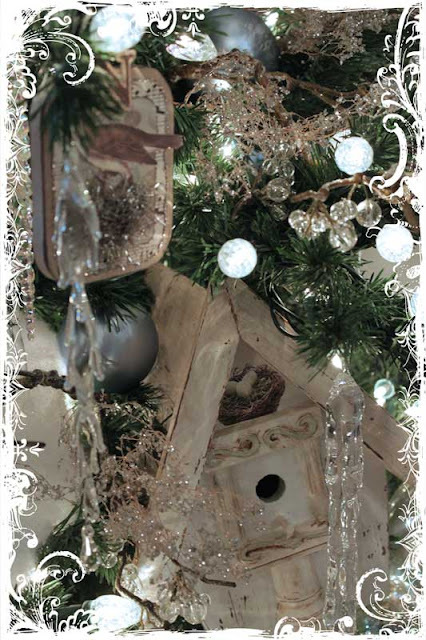 Place ornaments deep inside the tree too. Most trees have open space where you can see inside. By placing ornaments within the center of the tree you will give it a lot more depth. 3. Vary the size of your ornaments. Don't be afraid to put big things in there, especially if you use an artificial tree. If your tree is real, just secure them well and place them closer to the center for more support. 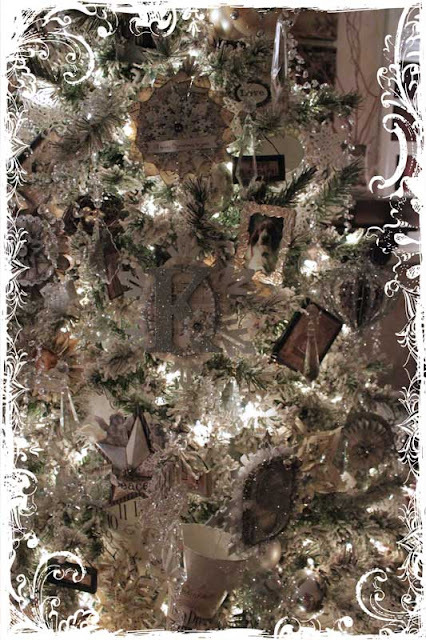 Trees can look kind of one dimensional if all the ornaments are close to the same size. 4. 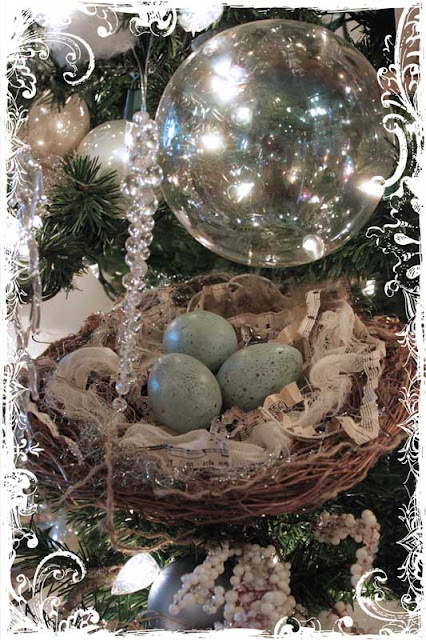 Use "unusual" ornaments in your tree. Books, picture frames, watering cans.. anything that goes with the theme or look you are trying to create. Don't use the string that comes attached to most ornaments. 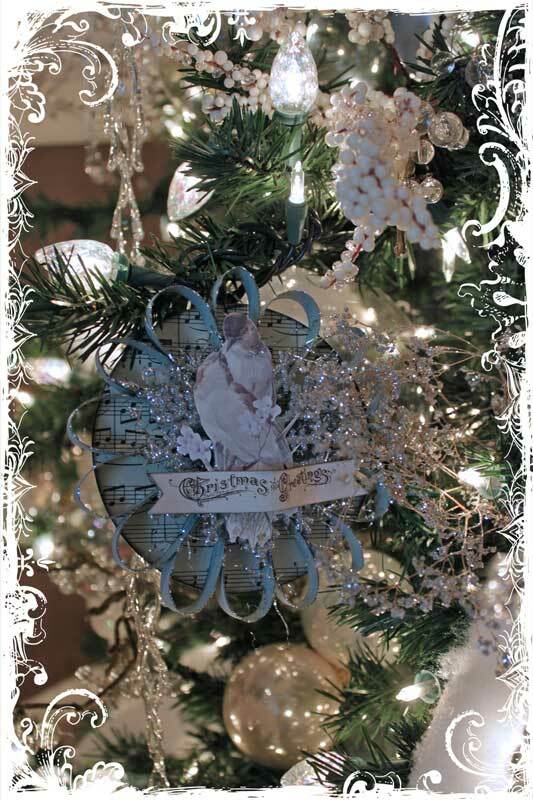 Instead snip it off and use wire or a pipe cleaner to attach the ornament as close to the branch as possible. If you can't see the hanger it looks so much nicer. 5. 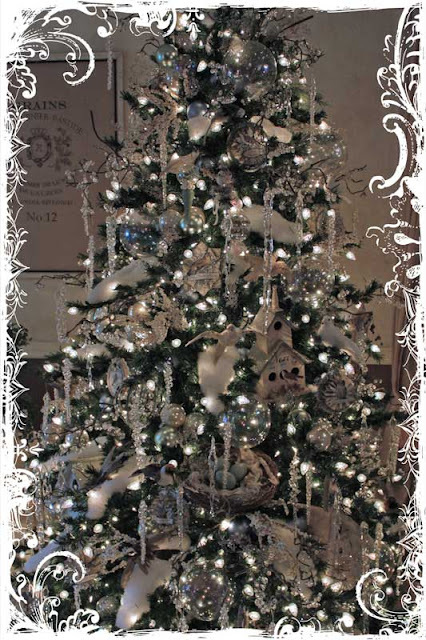 If you have a pre-lit tree and one or more of the strands goes out, it's not a lost cause. More often than not, this can be fixed. Ace Hardware and Lowe's (and maybe even Home Depot) has a tool just for that. It look like a ray gun, and the ones I've always seen are red. You simply take out one of the bulbs on the bad string of lights and place the zapper into the socket. Click it a couple of times and PRESTO the lights will work again. It has saved me from pulling my hair out more than a few times!! Well that's it! That's all I've got. I hope you enjoyed the tour and took away something useful to you. Be sure to hop over to 2805 and Debra's Common Ground to see the rest of the beautiful Christmas Trees and Vintage Christmas Inspiration!! WOW!!! I LOVE how both trees turned out. I am really burned out on all my trees. And I just don't know about that gun your'e talking about... I bought one last year & it didn't do a thing. All our trees (5 of them) are at least 10 years old or older & lights are going out. Baaaaaaaaaa Humbug.... I think I need your magic & a few elves. Good thing I don't have to put up much Christmas this year but, next year it will be our turn & I'll have to get my act together & be MORE LIKE YOU!!!! Woweeeee girlfriend, those are amazing trees! I like the livingroom one best as it's "drippier" than the other one. You are one fantastic and inspirational lady. Your trees are so gorgeous!!! Thanks for all the great tips! Your trees are just goregeous! They are dripping with beauty. Your trees are absolutely gorgeous! Thank you so much for sharing all the details! I love everything! Beautiful. I'm having trouble getting in the spirit and getting my tree up. I don't have room this year for my 9 foot one and the only other one is white. Thanks for the inspiration. I love every single detail...just beautiful!!! Not doing a tree this year, but have decorations out and a 1 foot tree in the kitchen, and lotsa lights....hugs..
Gorgeous with a capital G!!! Karen, your tree is beyond fabulous!!! It must be just amazing irl! Your trees are beautiful Karen! 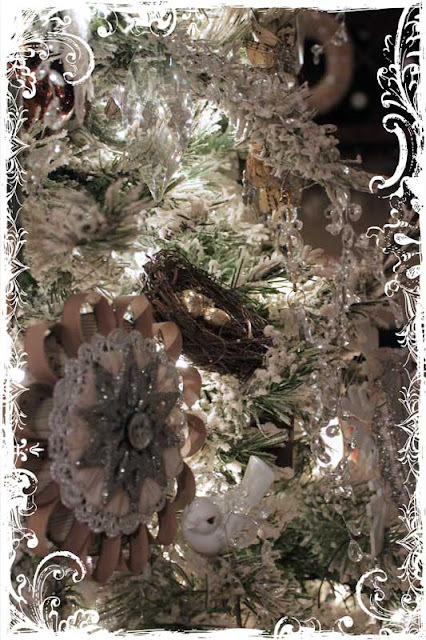 I love the flocked look of the first one so much...are the branches spray flocked? Thank you for sharing these beautiful creations. Oh Karen...your trees are gorgeous! You have such beautiful ornaments on both of them. I can see why your husband loves to have both of them up! Absolutely Beautiful! Both Trees are Perfection!I Love that you Made your Ornaments! So Very Special for you and your Family! Both of your trees are gorgeous, Karen! There is so much to discover. I have to look at the pictures again now. These are the prettiest trees ever! I am going to bookmark this post and spend the year trying to make ornaments so mine will be this pretty next year! Great tips! I too was trained by a professional from a national ornament and Christmas decor company. 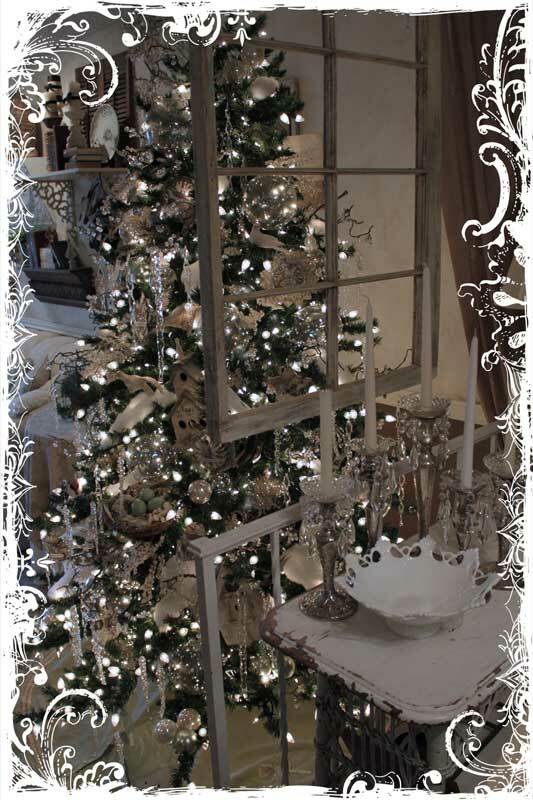 You are so right that pushing a lot of lights into the core of the tree makes it have a heavenly glow! One other tip is to wear thin cloth gloves while decorating your trees as sometimes the artificial branches can scratch up your hands. This was a must when I had to do over 20 trees in a department store. I am also a dripping sparkly icicle girl. Lots of clear glass or iridescent plastic balls pushed deep into the tree as well for shimmer. 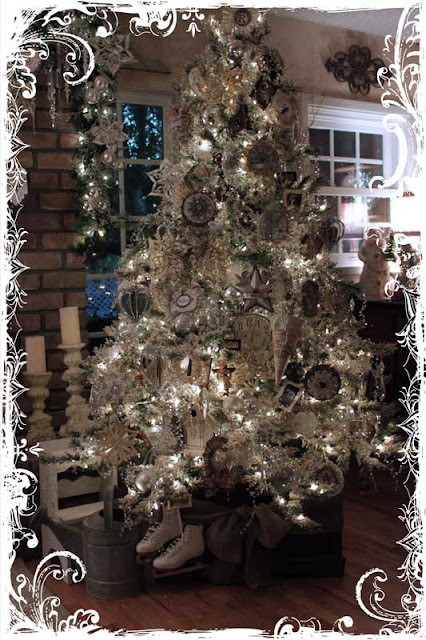 Karen you created two incredible beautiful trees! 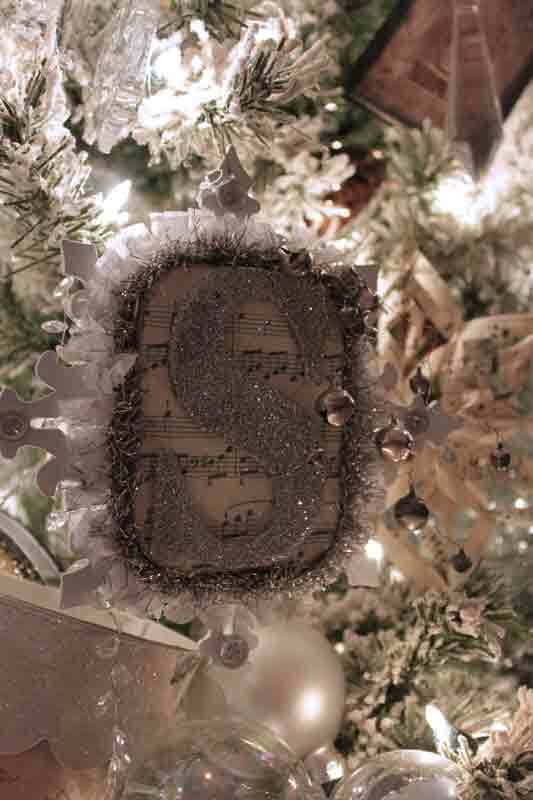 Your homemade ornaments are amazing! Enjoy those magical sparkling nights at your house this holiday! What gorgeous, glistening trees! I love the old world feel of the first tree. And the birds on the second tree are beautiful. I'm overawed by your tree Karen, I need to go back and look very closely. So very beautiful. Both of your trees are so beautiful! They have a lovely serenity about them. Your mentioning icicles, made me remember a little box of cyrstals that I've used before and they were right at my feet on the bottom shelf of my computer desk. I laughed in delight (because they weren't tucked away in the attic), stopped reading your post and hung them on our little tree. Thank you. It is gorgeous! How beautiful and original! As always Karen so gorgeous!! I always love seeing what you do throughout the year but, especially at Christmas. Love! You are so talented! Sometimes I get great ideas but can't put them together or make them work....you have a gift. These are gorgeous trees! I would love to sip hot cocoa by these beauties. wouawh !!! super super beaux ! 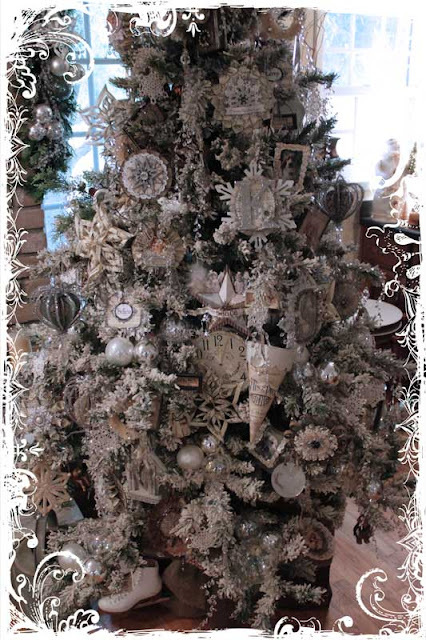 toutes ces décorations sont magnifiques sur tes sapins de noël, j'adore !! OMG!!!!!! Your trees are beyond beautiful. I love very single ornament I see. Thank you for the tour, I was inspired. I have learned quite a few things from your blog, Now I will get busy posting to my own. I haven't put the home trees up yet as time just seems to be running away from me - must make some time to get them done. Beautiful!!!! Glittery, gorgeous! I could gaze at your decor for hours! What beautiful trees! I was looking for ideas to make ornaments out of sheet music, and your tree inspired me to try some things....my mom had written a song and had it published many years ago, I thought that making ornaments out of one of the sets of sheet music would be an ideal gift to my kids as an heirloom. Thanks for the ideas and inspiration! Oh wow Karen! Your tress are amazing! They are both lovely! I looked at the pictures over and over! WOW! Karen these are amazing beauties! Thanks so much for sharing - I can see why dh wants 2! Well done!! Oh Karen, what an amzing white tree! 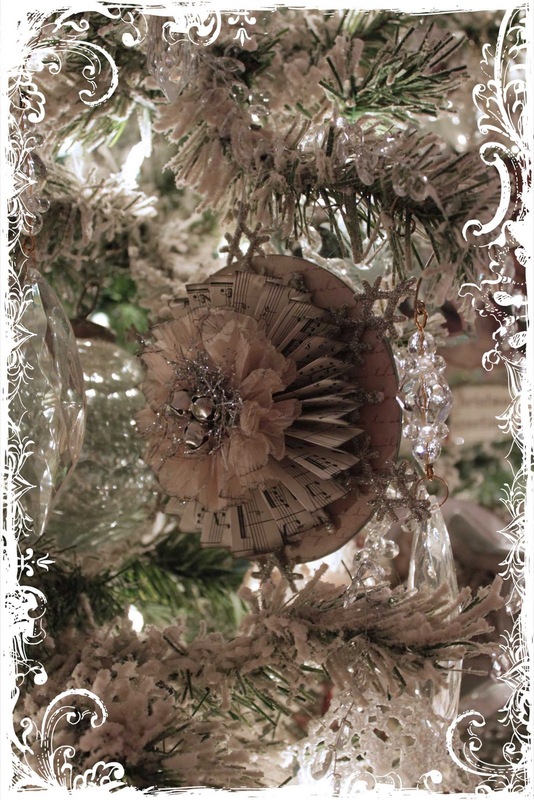 Every ornament and ball you've chosen is gorgeous and perfect for the creation of this magnificent tree! I could be in awe all day looking at it. Thanks for dropping by and for the lovely and kind comments you left me. Merry Christmas. How beautiful! I love the old glitter . Where do you get that? What beautiful trees and inspirational ideas! They are stunning! I'm so inspired, I may just get started on decorations for next year! Thank you for linking to the Christmas Party at 2805! I hope you will visit Hometalk, the generous sponsor of the $100 Pottery Barn Gift Card! OH MY GOSH!I have never seen such beautiful trees! I'm am going to have to rethink my entire tree next year! thanks for all the wonderful tips too! some of your ideas would never have occured to me!they are just gorgeous!!!!!! Thanks for the tips and tricks - making your post as unusual more than just a post!!!! Romeo gives you two paws up! Oh Karen, These are two of the most beautiful trees I have ever seen. Wish I could see them in person so that I could just study what you have done. Great job! Have you done a tut on how to make the big musical flowers with the birds in the center? I love them! I have been away for over 2 weeks on vacation and I am playing catch up. I have missed some of your posts. Best wishes to you and your family for the Holidays. You will never know how many things you teach me, with even the most casual of comments. "Spray glue!" My goodness, who knew? I love all your ideas. Thank you and keep enjoying this wonderful time of year. Beautiful trees! Long ago I used to decorate 2 and loved having one upstairs and one down. I know how much time it takes to make them look as nice as yours. Just beautiful, Karen! 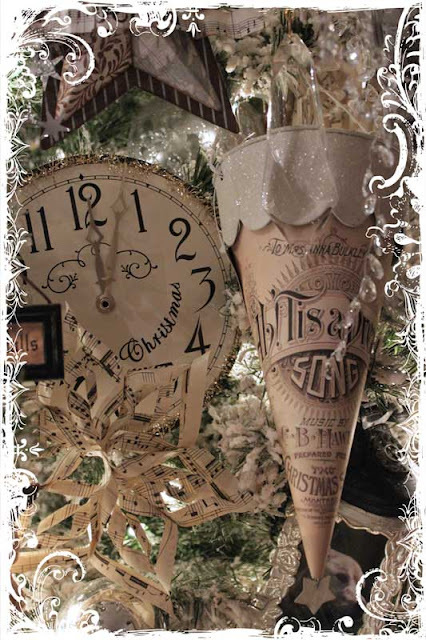 And such good tips for decorating the trees. I don't do that anymore, but I sure do enjoy looking at all the trees that are decorated. Thanks so much for sharing! Wow amazing...your trees are beautiful. Love, love, love your trees! Love the dishes tucked in. I think I will have to plan on redoing some of my trees (yes I said trees.. I know of 4 large trees). Thank goodness my daughter loves to decorate our home with me! goodness.. that is a fabulous christmas tree.. i like it so so much. Karen you are amazing... Just beautiful! Oh My Karen...your trees are absolutely stunning!!! I just LOVE, LOVE, LOVE them. 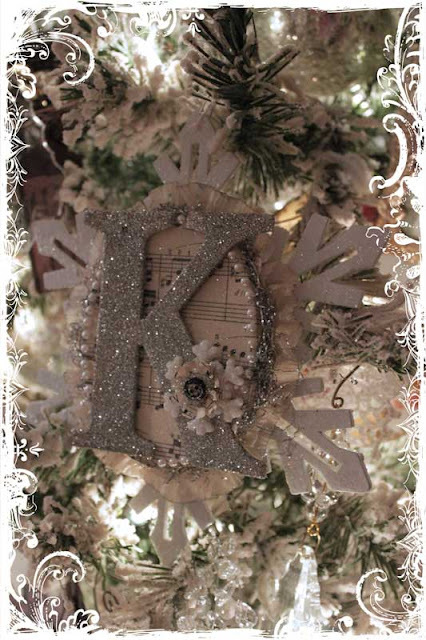 Your ideas and handmade ornaments are breath taking. Thank you for welcoming us into your gorgeous home. Wishing you and your family a blessed holiday season. HI KAREN ,YOU ARE SO TALENTED THE BEST PART OF IT IS YOU SHARE YOUR TALENT WITH US THAT IS SO WONDERFUL .I HAVE LEARN A FEW THINGS ABOUT CHRISTMAS TREES BOTH OF YOURS ARE MAGICAL.LIKE YOU SAID EXTRA LIGHTS MAKE A TREE FULL OF SPLENDOR, YOUR FAMILY IS BLESS TO HAVE YOU FRIEND..ENJOY YOUR DECEMBER NIGTH IN THE DESERT IS BEAUTIFUL YOU CAN TOUCH THE STARS WITH YOUR HAND AND YOU CAN BURN MESQUITE AND PINONES IN YOUR FIREPLACE I MISS THAT,I LIVE AT TUCSON ARIZONA FOR SOME TIME HAPPY DECEMBER KAREN XOXO. Well I ca't say anything that everyone else has said but it is beautiful and next year mine will be inspired by yours. Thanks for the tuts also. Merry Christmas. Just amazing, I agree with White Whimsey -"Fabulous beyond words!!!!" Truly a beautiful site to behold! You really know what your doing and I'm so glad you are sharing! Your house looks like a crystal paradise. Just plain gorgeous! Karen, I'm new to your blog but I have to tell you: After seeing all your pictures and reading your comments, I haven't had any sleep in two days, my house is falling apart, my dog has all but given up on getting fed and I can't get my jaw off the floor! You are Amazing! Thank you so much for posting! Truly, you have a gift for beauty! hi karen,your home looks like a beautiful winter wonderland...gorgeous...how long did it take you to decorate?fantastic,thanks for sharing! An ornament tutorial for you!